Cardiff-based bilingual media training provider, Sgil Cymru, kicks off the festive period with their third ‘Dathliad’ event. Sponsored by Wales Screen/Sgrîn Cymru, Lockett TV & Film Transport, and Creative Risk Solutions the event’s guest list included former Sgil Cymru trainees, apprentices and media industry professionals working in Wales and around the UK. 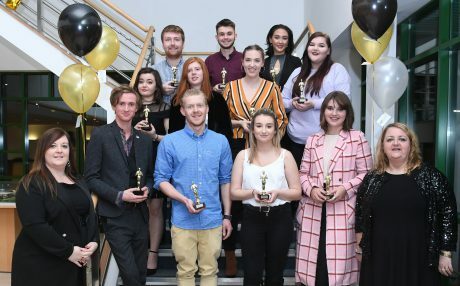 Sgil Cymru celebrates the achievement of 15 creative media apprentices successfully passing their frameworks with 14 of them continuing to work in the creative industries with employers such as BBC Cymru Wales, ITV Cymru Wales and Amplified Business Content. The highlight of the evening was the presentation of the Creative Risk Solutions Special Award that recognises the achievements of a former apprentice. Those in receipt of the award are considered an inspiration to apprentices of the future. This year’s prize of £250 was awarded to Ffion Taylor. Ffion was an Apprentice Runner with Green Bay Media (now part of Flame Productions) where she worked on a variety of factual and children’s programmes for a year. Following the completion of her apprenticeship in 2015, she continued to work for Green Bay Media as a Researcher for 10 months. Since then she has worked in online and corporate production, media training, animation and has been freelance for over a year working on productions such as Poldark and Renée Zellweger’s latest film, Judy. Sgil Cymru has firmly established itself as Wales’ lead media training provider with schemes ranging from three different apprenticeship programmes for new entrants to courses for Script Supervisors and Production Managers in the film industry. 2019 is set to be a busy year for the Sgil Cymru team with a Location Managers course in January funded by ScreenSkills and the Stepping Up programme for High-End TV Drama crew funded by Welsh Government and ScreenSkills returning for another year. Sue Jeffries, Sgil Cymru’s Managing Director said: “We’re very proud that the return of the Dathliad has established this event in the Welsh media industry calendar, and seeing so many familiar faces, from former apprentices to experienced industry colleagues, is a fantastic reminder of the importance of developing pathways into this exciting industry. “Thanks once again to our returning event sponsors Wales Screen/Sgrîn Cymru, Lockett TV & Film Transport, and our hosts Pinewood Studio Wales. Special thanks to Creative Risk Solutions for their generous support of their annual award recognising the inspiration that former apprentices can be to others.